WASHINGTON, DC, April 22, 2015 (ENS) – U.S. government agencies have entered into four collaborative landscape partnerships – in southwest Florida, Hawaii, Washington and the Great Lakes region – to help build resilience in regions vulnerable to climate change. The Department of the Interior, the Environmental Protection Agency, and the National Oceanic and Atmospheric Administration are the federal partners in the new Resilient Lands and Waters Initiative. With these agencies, state, tribal, and local partners will undertake landscape-scale management and attempt to enhance the carbon storage capacity of these natural areas. The three women who head these three agencies are convinced that climate change must be confronted with collaborative efforts to protect the planet. Interior Secretary Sally Jewell said today, “Climate change is impacting every corner of the nation – from the Everglades to the Arctic – which has ramifications for our natural and cultural heritage, public health and economic activity. “Through increased collaboration, we can pool resources and bring the best available science to bear as we take a landscape-level approach to make these treasured lands and waters more resilient to the impacts of climate change,” said Jewell. “The lands and waters initiative will help our partners better understand the climate change risks and uncertainties in these geographies, and provide decision-makers with actionable information to make their environment, community and economy more resilient to these changes,” Sullivan said. The Resilient Lands and Waters Initiative is a big picture effort to conserve coastal wetlands and marine conservation areas, protect drinking water for urban areas, and safeguard wildlife habitat. In the Great Lakes, the partners are developing a coastal wetland prioritization tool to determine where restoration efforts are most needed. High quality wetlands improve climate resilience through flood mitigation and storm water storage as well as serving as carbon sinks for greenhouse gas emissions. 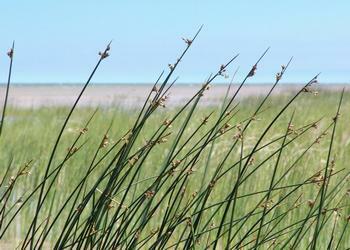 The Upper Midwest and Great Lakes Landscape Conservation Cooperative is leading the effort, which spans Lakes Huron and Erie coastal wetlands in Saginaw Bay to the Maumee River. In Hawaii, projects will take place in West Hawaii, West Maui and in the He’eia watershed on the island of Oahu. On Kaneohe Bay, He’eia is the site of the largest remaining traditional fishpond on the island. In these locations, organizations are using NOAA’s Sea Level Rise Viewer to see maps of the potential impacts of sea level rise. 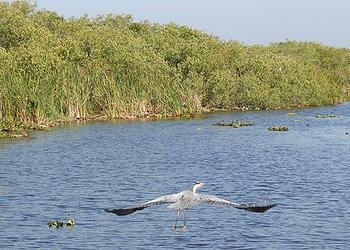 Southwest Florida includes diverse habitats such as Everglades wetlands, coastal mangroves, sea grasses, oyster reefs, and estuaries. Inhabited by the endangered Florida panther, the region faces threats from increasing urbanization and land use changes to invasive species, rising seas, and shifting weather and temperature patterns. This resilient landscape work will be led by the Cooperative Conservation Blueprint for Florida and Peninsular Florida Landscape Conservation Cooperative. In Washington’s Puget Sound projects will affect the entire Snohomish River watershed by restoring important tidal wetland habitats, which is expected to have major climate mitigation benefits. Over the next 18 months, the partners will work together to develop more explicit strategies and maps to benefit wildfire management, mitigation investments, restoration efforts, water and air quality, carbon storage, and the communities that depend upon these natural systems for their own resilience. By tracking successes and sharing lessons learned, the initiative will encourage the development of similar resilience efforts in other areas of the country. The Resilient Lands and Waters initiative is a key part of the Obama Administration’s Climate and Natural Resources Priority Agenda, a first of its kind, comprehensive commitment across the federal government to support resilience of America’s natural resources. When President Obama launched his Climate Action Plan in 2013, he directed federal agencies to identify and evaluate approaches to improve natural defenses against extreme weather, protect biodiversity and conserve natural resources in the face of a changing climate. The Climate Action Plan directs agencies to manage U.S. public lands and natural systems to store more carbon to avoid releasing it into the atmosphere where it forms a heat-trapping blanket around the planet.